Last year was especially hard on the financial sector. It developed the reputation that the banks could sustain a rally. But one segment within the financials is hotter than ever and held up well even last year. 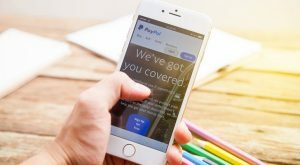 Unlike traditional money centers, financial technology or “fintech stocks” like PayPal (NASDAQ:PYPL) and even old dogs like Visa (NYSE:V) or Mastercard (NYSE:MA) continue to rally through thick and thin. Wall Street is enamored with their business models, and this has benefitted PayPal stock. In fact, PayPal stock is up 21% in the past 12 months; whereas, the Financial Select Sector SPDR ETF (NYSEARCA:XLF) is down 10% for the same period. The fastest and most expensive runner of the fintech bunch is Square (NYSE:SQ), which is up 35% year-to-date, but PYPL, V and MA are all strong regardless as each is up around 15% for the same period. Today, the story is about PayPal and how it should be a winning investment for the long term and offer short-term opportunities. For years, the global trend has been to transition finances to strictly online transactions. From regular shopping to global money flow, we demand our money to flow fast and worldwide. This was most evident during the Bitcoin craze of 2017. Although the value of the coin is debatable, everyone agrees that the blockchain technology behind it is attractive and encapsulates the concept. Transactor companies like Paypal offer the blockchain concept of moving money fast and they are operational now. So they are best suited to sustain their success for years to come. Since the transition to electronic finance is in its infancy, there is enough business for all the current competitors to thrive. So PYPL stock is likely to do well for the long term, but the problem for investors is that it’s a momentum stock. It moves fast in both directions and this presents a problem to many. On the way up it seems like it’s ready to correct thereby forcing traders to miss out on the upside. Case in point, while Wall Street is still expecting a correction in stocks, PYPL stock is almost at its all-time highs. Clearly, the fintech bulls are used to the momentum aspect of this trade. The idea is to buy high and sell higher. Else we’d end up missing the whole trade. Fundamentally, Paypal stock is not cheap. It is almost twice as expensive as V and three times as expensive as American Express (NYSE:AXP). But for as long as it is growing fast, investors will give it a pass on that front. Younger companies need to over spend in order to catch up so it is more important that traders judge their top line performance and not the margins. At least PYPL is in the black whereas SQ still loses money. For those who want to own the shares for the long term, then, the actual timing is less important. If the stock market is rising, then PYPL will be higher later. But not every one wants to hold stocks for the long term and for those kinds of investors, there are short-term clues for more surgical entry and exit points. For the short term, PYPL is near its all-time highs, so buying it up here requires courage. But with proper stop loss levels, traders can do it provided they stick to their exit points well. PayPal stock recently broke out of the $94 zone so that would be the best level of short-term support if the rally fades from the top. The closest support level, which usually is the weakest, is at $97. Below that, there are two similar supports at $96 and $95. So depending on personal preferences and risk tolerance, those would be the significant short-term levels to trade. This only applies to those in it for the short term. Longer term, it can fall to $88 per share and not change the bullish thesis much. In summary, Wall Street is attracted to financial tech because the transition into an electronic environment plays right into the hands of companies like PayPal. That means you can own it or trade it with confidence for years to come. Article printed from InvestorPlace Media, https://investorplace.com/2019/03/paypal-stock-plenty-room-to-run/.